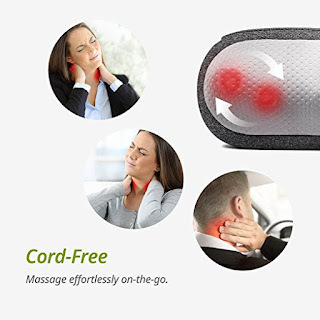 Today only, while supplies last, you can score this Mynt Cordless Neck Back Massager for ONLY $29.99 (Retail $99.99). I recently bought a similar one and I love it! It gets a very deep massage and leaves me feeling very relaxed. •Prizewinning: Recipient of the world-renowned iF Design Award (2018). •Cordless: A built-in battery provides up to 2 hours of power so you can unwind anytime, anywhere. •Broader Massage: 4 flattened shiatsu nodes target your body's acupoints with wider treatment. Use from head to toe, for full-body therapy. •Premium Performance: A soft, multi-layer build delivers 3D massage that's robust, yet kind to skin. •Super streamline, with warming function and single button operation. •What You Get: Pillow, Charging Cable, Manual, 24-month warranty and fan favorite support.